If you’re a business owner or marketing professional, you hopefully understand the importance of having a social media presence. Profiles and accounts on Facebook and Twitter can assist in your branding, engagement, and ecommerce efforts, along with many other objectives. But without the right analytics, you may be left wondering, “How much do my social media efforts help my business?”, or “How can I track my social media performance?” These are very common but important questions. In today’s day and age, it’s possible to know exactly what is working and how much benefit is provided – as long as you have the right tools. Fortunately, with Google Analytics, this information is readily available. Google Analytics is one of the most popular analytics platforms on the market. And if you already have an account, you can use it to track and analyze data from your social profiles! Google Analytics social media tracking, or Social Analytics, is an easy to use tool that helps with measuring your social media performance. Here are some tips to get you started with setting up and using Google Analytics social settings for reporting on social media analytics. First, you need to decide what your social media goals are. What is most important for you to get out of your social media efforts? Beyond platform-specific metrics like favorites or retweets (which are only visible in each platform’s analytics features – not Google Analytics), you need to figure out which metrics are important for your business. Do you want to use your social accounts to direct traffic to certain pages on your site? Do you want visitors to take certain actions when they get there? Regardless of what your goals are, it’s important to define them before you get started. Without doing so, all the analytics in the world won’t help you understand whether or not your time on social media is well spent. Once you’ve determined what you want to accomplish – traffic to a certain page, time on site, or conversions – set up your goals in Google Analytics. If you’ve never done this before, Google offers a step-by-step tutorial. Hint: Your goals should be consistent campaign-wide. The social analytics reports will filter out data that is not relevant to your social media campaigns. Once your goals are set up, you’ll have access to all the social media-specific data that you need! Now that you have your goals defined and set up, you are ready to use Google Analytics for social media tracking. 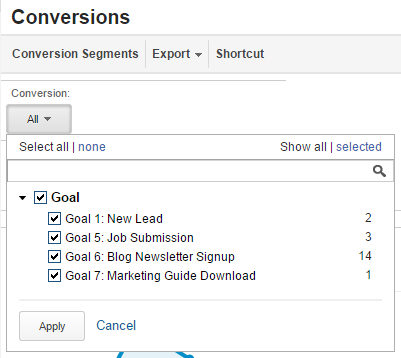 Google Analytics offers eight standard reports on Social Analytics. You can find these reports within Analytics by navigating through Reporting > Acquisition >Social. The Overview report allows you to see the conversion value generated from social media. Network Referrals will show you how much referral traffic each social network supplied to your site. The Social Data Hub report allows you to see how people are sharing or interacting with your content off site. The Landing Pages report allows you to see the engagement metrics for each URL for sessions that originated from your social networks. The Trackbacks report allows you to see when your website content is baring shared, by whom and in what context. Conversions. This is why it is important to set up goals and assign them a value. The Plugins report tracks when a “Tweet” or “Like” button are clicked on your site. For more insight visit Social Plug-In Analytics. The Users Flow report shows you a map of the users visit starting with the social network to where they left your site or, better yet, converted. If you’re just looking for a basic overview of your social performance, the Overview report is all you need. This report shows you the total number of sessions, broken down by social network, from social referrals and the total number of conversions to which your social media campaigns contributed. For someone that just wants to know the basic data, this should be plenty. The Landing Pages report shows which pages people are entering your website on and what social media network they are coming from. Data from this report provides great insight if you’re trying to increase traffic to certain pages on your website. The Conversions report within Social Analytics will filter out all non-social conversions, then break down conversions by social network. The report will also list out the total conversion value (set by you when you set up your goals) for your social media efforts overall and by each individual social media platform. If you’ve properly set up your goals, this report should be a clear indication of how your social media efforts are contributing to your conversion goals! Again, having clearly defined goals helps you access the data you need within the Social Analytics reports. Make sure to reference the bullet point list in section 2 of this post to help you find the report that has the data you are looking for. Once you get familiar with this data, you can easily pull together reports to show the value of your social media accounts and efforts. You will also have access to insightful data to show you how you can improve your social media efforts to more effective and to drive more goal conversions! If you have any questions about using Google Analytics for social media tracking, or know of any additional methods I didn’t mention here, let me know in the comments below! Will is Internet Marketing Specialist who loves marathons (running & Netflix) and craft beer.